Played in the spring at the Box Elder High Middle School Gym. This has been a long time favorite for local families and friends. Two divisions will be offered to allow for teams to play just for fun with friends or step up a notch into the more competitive B league. Watch the local paper for league announcements or contact Jackie Christensen, Recreation Coordinator, at (435)734-6607. 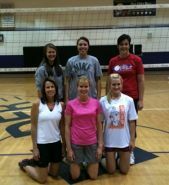 2011 Women's Volleyball Champions "Klein Chiropractic"